Spring on the Great Lakes arrived late in the year 1872 and boat captains were anxious to get the shipping season started. But a heavy layer of ice kept main routes blocked. Capt. A. Reed, master of the propeller Lawrence, was among the skippers waiting at the eastern end of the lakes. His steamer was moored at Ogdensburg, N.Y., on the upper end of the St. Lawrence River. The Lawrence was just one of a fleet of boats anchored in the area and waiting to enter Lake Ontario. They were blocked by a giant layer of ice, blown there by westerly trade winds. Waiting for the ice to melt was a slow and maddening process, especially when idled boats cost their owners money. His patience ran thin and Reed decided to try to force his way through the ice. 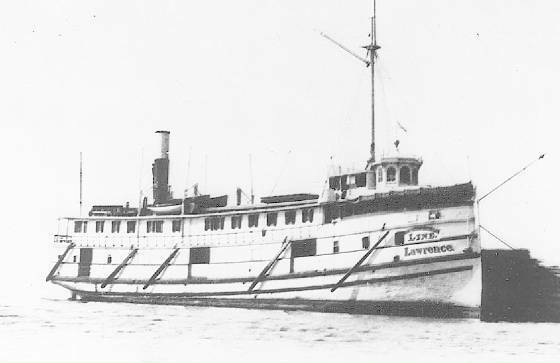 On April 22, with a full cargo including eight paying passengers and nine horses, all bound for Oswego, the Lawrence weighed anchor and steamed up the river on the first leg of was turned out to be a strange journey. The river was open all the way to Cape Vincent, where the steamers Oswegetchie, Brooklyn, Young America, Empire and Milwaukee were anchored, also waiting for the ice to melt. All were laden with cargo. There, Reed loaded extra provisions and fuel, and then steamed off into the ice field. The other skippers watched with interest. Some decided to follow. They reasoned that if the Lawrence could break a route open through the ice, they would be foolish not to follow. As one captain fired up his boilers the others, seeing the black coal smoke rolling from the stacks, began doing the same thing. Soon a line of boats steamed off behind the Lawrence. Within hours the entire fleet was caught in a lake filled with large shifting, unstable ice slabs. All of the vessels found themselves trapped. Black smoke poured from their stacks as the vessels spent the hours ramming and beating against the heavy ice, sometimes gaining only a few feet of leeway. Some of the passengers on the Lawrence later told of their experiences when interviewed by the Oswego Times. They said it was the most unusual trip they ever made. They told of looking daily over a magnificent winter scene that was constantly changing. There was ice as far as the eye could see, and as many as 13 other steamers in view, all of them belching thick black smoke. The battle continued for days. The passengers and crew passed their time playing cards and telling stories. Everybody remained in good spirits throughout the ordeal. Even Captain Reed sat in on a few card games. He expressed confidence that the Lawrence would find a way through the ice. Because of his attitude, nobody on the boat worried that their mission might fail. At one time the feed for the horses ran low. Reed found out that one of the other boats in the convoy, the City of Boston, was laden with a cargo of corn. He sent a delegation across the ice, dragging a lifeboat in case they ran into thin ice, to fetch enough corn to feed the animals. They got to the City of Boston and back safely and the horses were fed. The fleet remained locked in the ice from Tuesday afternoon until the following Sunday, April 28. By then the boats had worked their way several miles south of the False Duck Islands. That morning, not long after sunrise, Reed discovered that a shift in the wind had opened a channel through the ice leading due north. He turned his boat into the rift and the other boat captains jumped in line behind him. This led to still another patch of clear water that eventually brought the fleet out into clear water. Reed’s gamble paid off. All of the boats made it safely through the ice.